However, even if there are good (non-ego based) reasons for using skill displays, there might be even better reasons for not doing so. The most common reason offered is that, "It hurts the magic." The argument goes that if you don't "hide your skill," the audience will have a ready explanation for bow your miracles are achieved. It allows them to dismiss them as "mere" sleight of hand. It prevents them from experiencing what they're seeing as magic. I strongly believe that your primary job as a magician is creating a magical experience for the audience. Therefore, if this objection were true, none of the arguments Tve given above would count for much and I would readily agree that skill displays should be avoided. Only, it isn't true. Imagine that you perform two minutes of non-stop card flourishes for an audience. You then cause the deck to float five inches off the table while standing at some distance from it. Will the audience dismiss the levitation by saying, "It must be sleight of hand?" Of course not. Although they know that you're adept at sleight of hand, they can't dismiss this phenomenon as sleight of hand because skight of hand cant account for what they're seeing. A real-life example of this could often be seen years ago on The Amazing Kreskin's TV show. He would often perform card effects that he explicitly presented as demonstrations of sleight-of-hand skill. He would then perform a mental effect with cards that the viewing audience would unhesitatingly accept as real mind reading. And why not? How could sleight of hand explain how he could know what cards five people had peeked at in a deck tossed out to the audience? The answer is obvious; it couldn't. Another real-life analogy to my fictional example could be seen in the performances of Del Ray. Anyone who has seen him work knows that his performances came as close to real magic as that of any close-up magician. Yet he never failed to include such flourishes as Ian shuffles and ribbonspread turnovers as well as gambling routines. When, a moment later, a toy mouse emerged from it's house and made a beeline for the selected card, no one thought, "Bah, mere sleight of hand. Anyone who can ribbonspread cards or deal himself a winning blackjack hand can make an inanimate object come to life." In fact, even when he performed more traditional card tricks such as Bro. Hamman's Final Ac& Routine, the prior displays of skill didn't keep the effect from coming across as pure magic. Laypeople have no trouble distinguishing between demonstrations of sleight-of-hand skill and effects that (seemingly) can't be explained by sleight of hand. Simply put, it becomes magic the moment you violate natural law. Laypeople are intelligent enough to grasp that, even if some magicians aren't. When performing the Cup s and Balls, Dai Vernon would perform a wand spin as a magical gesture to cause a ball to vanish. Like Cardini's fans, Vernon's wand spin flourish demonstrated his digital skill almost simultaneous to the occurrence of the magic. Yet audience reactions made it clear that the flourish did not diminish th& magic. The fact that Vernon had the skill to spin a wand with one hand in no way explained how the ball magically vanished from his other hand. Another of the greatest modem magicians when it comes to creating a magical experience is René Lavand. Yet he peppers his performances with one of the most difficult and impressive of flourishes, the one-handed riffle shuffle. It doesn't seem to "hurt the magic." So why is it that, when René performs his six-phase Oil and Water routine, his CaU to the Colors routine, or his Three Bread Cnfmbs routine, it looks like magic? It's not because the audience doesn't know that he has sleight-of-hand skill; it's because the slow, open» and deliberate handling appears to leave no possible room for sleight of hand. The point of these examples is not to argue by authority (i.e., these famous guys did it so it must be a good idea). The point is not that they used flourishes but that those displays of skill did not hinder them from creating a magical experience for their audiences. 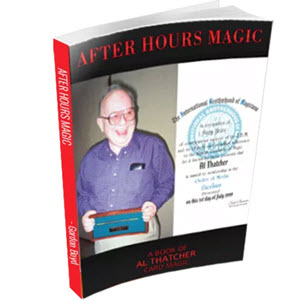 Indeed, the magicians I've cited are among the most successful ever in creating true magic. The fact that displays of skill and breathtaking, magical magic can coexist within the same performance, within the same effect^even, as we've seen, within virtually the same instant—is a fact. These examples establish that fact. Any magic theory that contradicts the facts must be wrong. As I've written elsewhere. theory should help you understand reality, not help you ignore it. Understanding how and why skill displays and magic can coexist will illuminate your understanding of how audiences experience magic. This can make you a better magician regardless of whether you decide to perform flourishes or avoid them.